Quick recap: A man insists to a woman that he met her last year at-you guessed it- Marienbad. Fun (?) fact: Delphine Seyrig, who plays the female lead, was Jeanne Dielman! I knew that movie would come back sooner or later to haunt me. My thoughts: Have you ever seen a perfume commercial and thought to yourself that it would be better if it was an hour and a half long instead of just 30 seconds? Well, then I have news for you! 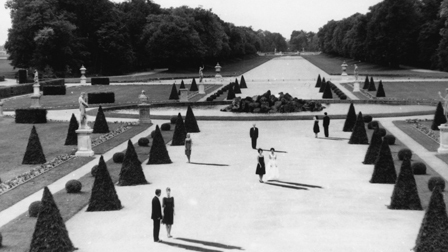 All your twisted dreams have come true in Last Year at Marienbad. The movie starts with a voiceover repeated the same few lines over and over and then there are people talking and then the rest of the film is the two main stars (who have no names, by the way) staring off into the distance, or sometimes at each other with pained expressions. Far be it from me to stereotype any kind of movie, but this one is very, very FRENCH. I think that if all of the words were left out of the movie, it would’ve been more enjoyable to watch. The acting was meh but I absolutely loved the scenery and the costumes. The costumes, by the way were designed by Coco Chanel, which makes me wonder if this wasn’t actually a perfume commercial I watched after all. The music, too, was nice and suspenseful, although a little much sometimes. So, I guess the question I’m supposed to ask is ‘did these two people actually meet last year….in Marienbad?’ and the answer is, maybe? I don’t know. The guy sure had some specific memories and even a picture of the woman he had an affair with, but she also seemed completely confused by the whole thing. One theory I read online was that the man was actually the woman’s therapist and he was inside her mind, trying to unblock something that had happened to her last year….in Marienbad. Another theory says that the man is from a parallel universe and is trying to warn the woman of something horrible about to happen this year….in Marienbad. Personally, I found the explanations much more interesting than the actual movie. Also, I could really go for some Chanel No.5. Is that still sold in stores?